As the completion of the Panama Canal expansion project draws closer, ports across the eastern seaboard from New York to Miami are preparing with expansions of their own. The expansions are mandatory for ports wishing to accommodate so-called Super Post-Panamax Megaships. These vessels can be up to 235 feet longer and 54 feet wider than the current Panamax class. More importantly, they can handle as much as 12,000 TEU (twenty-foot equivalent units – a measure of cargo ship capacity) compared to the Panamax ships that hold no more than 5,000 TEU. In addition to projects that will deepen the ports as part of preparation for the larger ships, heavier cranes to handle the increased capacity will be required. These cranes weigh between 1600 and 2000 tons – roughly twice the weight of average port cranes – and will require waterfront foundation redesigns among other infrastructure improvements. Other enhancements underway include government agencies working to expand security scanning capabilities and port authorities upgrading to systems that not only deliver more efficient equipment interchange, but are also eco-friendly and energy-saving. Locally, east coast AIT stations and gateways are poised to capitalize on the opportunities presented by port expansions in their regions. In Savannah, Georgia, the river is being deepened while the port of Charleston in neighboring South Carolina is also expanding. In addition to transpacific eastbound cargo growth, the Global Services Regional Manager of AIT's Atlanta Global Service Center is expecting the US to Europe and US to Asia export LCL (less than container load) consolidation markets to grow as a result of the increased capacity. "The cost benefits associated with larger volume ships will help us provide better carrier choice and service reliability," he says. "Our ability to articulate our partnerships with the vendors embracing eco-friendly trends in global shipping and logistics will pay good long-term dividends." Further south, as the port closest to the Panama Canal, the Port of Miami expects to be the most desired destination for the post-Panamax ships. The port's Deep Dredge project aims to deepen Biscayne Bay to 50 feet from 42 feet. Additionally, the Port of Miami Tunnel Project will offer trucks a more direct route to and from the port with a bypass of downtown Miami and a 4.4 mile rail link between the port and Hialeah intermodal rail yard is under consideration. Jaime Cabrera, AIT’s Director of Latin American Development, says new trade agreements with Latin America have sparked expansion interest. He adds, "The growth in Latin American and Caribbean markets combined with port expansion will help to increase transshipping through Florida in the coming decades." To date, the ports in Norfolk, Virginia, Baltimore and New York have channels with sufficient post-Panamax depth. Baltimore’s Seagirt Marine Terminal will have the additionally required 50-foot container berth before the end of 2012. The Port Authority of New York and New Jersey, however, must complete their $1 billion project to raise the Bayonne Bridge by 65 feet before the megaships can pass underneath. 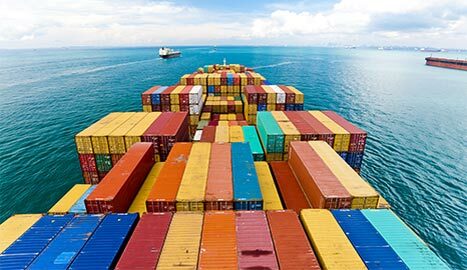 AIT offers custom sea freight solutions for virtually any industry. See how AIT has helped organizations in your industry.